Clinical psychiatry has always been limited by the lack of objective tests to substantiate diagnoses and a lack of specific treatments that target underlying pathophysiology. One area in which these twin failures has been most frustrating is major depression. Due to very considerable progress in the basic and clinical neurosciences of sleep-wake cycles and underlying circadian systems this situation is now rapidly changing. The development of specific behavioral or pharmacological strategies that target these basic regulatory systems is driving renewed clinical interest. Here, we explore the extent to which objective tests of sleep-wake cycles and circadian function - namely, those that measure timing or synchrony of circadian-dependent physiology as well as daytime activity and nighttime sleep patterns - can be used to identify a sub-class of patients with major depression who have disturbed circadian profiles. Once this unique pathophysiology is characterized, a highly personalized treatment plan can be proposed and monitored. New treatments will now be designed and old treatments re-evaluated on the basis of their effects on objective measures of sleep-wake cycles, circadian rhythms and related metabolic systems. Nowhere is the loss of confidence in the diagnostic processes in psychiatry more acute than it is in relation to the major depressive disorders [1, 2]. This is reflected not only in the acrimonious debate about proposed changes to the Diagnostic and Statistical Manual of Mental Disorders (DSM)-5 , but also in the degree of professional discord  and the sustained social critique of the current concepts [5, 6]. More profoundly from a therapeutic perspective, it has contributed to the withdrawal of major pharmaceutical industry support for new drug development . This all occurs at a time when internationally there is widespread recognition of the premature death and disability attributable to mood disorders, reflecting their early age-of-onset, high population prevalence, chronicity, comorbidity with physical illness and the degree of resultant impairment [8–10]. To reduce that burden, earlier identification and enhanced long-term care of those who are at risk or are in the early phases of life threatening or chronic disorders has been prioritized [8, 11–15]. However, this key ‘pre-emptive’ approach is compromised by poorly-validated and entirely descriptive diagnostic systems [11–15]. Further, these systems were based on the experiences of middle or older age cohorts with recurrent or persistent disorders. By contrast, one of the few concepts that can be supported neurobiologically is that early-onset major depression (that is, develops before age 25 years) is pathophysiologically distinct from late-onset major depression (that is, develops after the age of 50 years, and typically in association with other genetic or vascular risk factors [16–19]). When the current criteria are used as the basis for identifying biomarkers of a risk or illness course in very mixed clinical populations of those experiencing major depression, they result in very poor specificity. Previous attempts to link major depression to dysregulation of the hypothalamic-pituitary (HPA) axis were abandoned for this reason [20, 21]. In parallel, there has been a failure to link major depression to any clear set of genetic risk factors . Most importantly clinically, the outcome of current treatment trials is highly compromised. The examination of very heterogeneous groups of subjects, and particularly the inclusion of those with lower levels of severity of illness, appears to contribute substantially to the general failure to identify specific biomarkers and the large differences between active and placebo therapies [23–25]. Depression treatment is also sub-optimal due to the general lack of rapid onset of action. The risk of suicide or other self-harm remains high during the period of acute depression and only decreases substantially in parallel with the provision of effective treatments . While various phenotypically-defined subgroups (for example, severe, melancholia, anxious or psychotic depression) have been proposed historically, each subtype has achieved only limited success against the key validating principles of specific genetic or environmental risk factors, discrete pathophysiological pathways or unique patterns of response to treatment. Instead, much clinical and epidemiological innovation has switched to identifying clearer points of illness onset and subsequent developmental paths, particularly those that occur from early adolescence through to early adulthood. While this approach was first utilized for psychotic disorders [27–29], current efforts now also focus on applying these techniques to the major mood disorders [30–33]. Marked interdisciplinary progress in the clinical and basic neurosciences of sleep-wake cycles and underpinning circadian systems has opened the door to a new way of conceptualizing at least a significant subpopulation of those who present with major mood disorders. The role that disruption of sleep-wake and circadian systems play in the risk of onset, early course, comorbidity, recurrence, persistence and the physical health complications of major mood disorders is being rapidly elaborated [34–38]. For example, our group has reported that short or excessively long sleep duration is associated with the onset and persistence of psychological distress in a sample of 20,822 people aged 17 to 24 years . Key findings also come from experimental studies in healthy adults showing that delaying sleep onset or disturbing circadian synchrony causes profound changes in mood, cognitive function, motor activity and subjective symptoms of energy and well-being [40, 41]. A growing body of studies conducted in subjects with other psychiatric illnesses (for example, psychotic disorders) also highlights associations between sleep-wake and circadian disruptions, concurrent mood disturbances and metabolic and other physical health complications [42–45]. This paper provides an overview of the extent to which current self-report and objective measures of sleep-wake cycles and circadian systems can be used to characterize individuals presenting with major mood disorders. It also considers how such clinical information can be used to inform choice of specific behavioral or pharmacological regimes and to monitor short and longer-term responses to treatment. Circadian systems need to be considered in relation to three differing levels of organization of information and operation (see Figure 1). First is the way in which the physical environment communicates (or ‘Inputs’) key information, particularly related to differentiation of night from day, to the internal ‘master’ clock (located in the brain’s suprachiasmatic nucleus (SCN)). Second are the ‘Intrinsic’ brain factors, consisting of the master clock and its linked regulatory systems (notably secretion of melatonin from the pineal gland). These contribute to sleep onset, sleep architecture, sleep-wake cycles and other central nervous system (CNS)-dependent behavioral changes. Third is the way in which the circadian system coordinates all other hormonal, metabolic, immune, thermoregulatory, autonomic nervous and other physiological processes to optimize the relationships between behavior and body functions (that is, the ‘Outputs’). 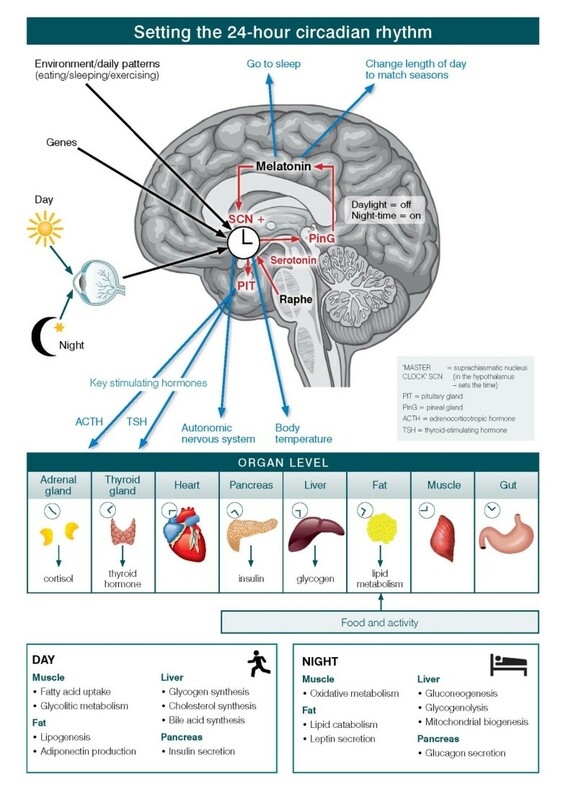 The master circadian clock in the human brain. At the cellular level, almost all individual cells and, hence, organ systems have their own intrinsic clocks. As these cellular (for example, fibroblasts, fat cells, muscles) and organ-based (for example, liver, pancreas, gut) clocks run to intrinsically different period lengths, the differing physiological systems need to be aligned in coherent patterns. Fundamentally, the master circadian clock permits the organism to align key behavioral and intrinsic physiological rhythms optimally to the external 24-hour light–dark cycle . The brain’s master clock (in the SCN) is a small cluster of pacemaker neurons in the anterior hypothalamus. It operates a complex auto-regulatory network, utilizing a set of transcriptional activators and repressors [47–49]. These processes are under the control of a core set of regulatory genes including: Period – Per1, Per2 and Per3; Cryptochrome – Cry1 and Cry2; Nuclear receptor subfamily 1 – Nr1d1 (REV-ERB-α) and Nr1f2 (ROR-β); Circadian Locomotor Output Cycles Kaput – CLOCK; and Aryl hydrocarbon receptor nuclear translocator-like – Bmal1 and Bmal2. The transcription of PER and CRY genes is activated by the binding of BMAL1-CLOCK or BMAL1-NPAS2. The expression of PER and CRY genes is rhythmic and is highest early in the day. Light exposure also drives the PER1 and PER2 expression genes. The progressive accumulation of the proteins that result from this activated transcription, over the daily period, eventually feeds back (via the formation of Per-Cry complexes) to reduce their own transcription (the so-called ‘hour-glass’ effect). The strong correlation between gene expression and circadian transcription factor binding leads to genome-wide circadian rhythms . Across the past decades, it has been well established that the disruption of various components of the molecular clock leads to significant changes in circadian phenotype [51, 52]. This 24-hour self-regulatory process is also influenced by a much wider set of small molecule modifiers, other genetic factors and transcriptional repressors (for example, deleted in esophageal cancer 1 - Dec1 and Dec2) . There are key proteins that impact on timing of the clock (through phosphorylation) including casein kinase (CK) 1 delta and epsilon (Csnk1d and Csnk1e). Selective inhibition studies indicate that Csnk1d appears to be a predominant mediator of circadian timing [54–56]. A variety of other protein kinases and phosphatases can also impact on circadian timing. The expansion of animal models (particularly in mice and zebrafish [57, 58]), utilizing genetic manipulation or new environmental or developmental models, has created important new tools for further unraveling the complexity of these processes. Glycogen synthase kinase 3 beta (GSK-3β) plays a key regulatory role in circadian rhythms as it phosphorylates the mammalian Per2 protein, facilitating nuclear entry - a key step in the auto-feedback loop. It is now more than 60 years since the anti-manic effect of lithium was first reported . A key clinical observation relates to its calming effect without causing overt sedation. Another key aspect is that its main therapeutic value is in the longer-term reduction in symptoms of mania and prevention of relapse. Recently, the inhibitory effects of lithium on GSK-3β have been described . However, there is ongoing debate as to whether the characteristic period-lengthening effects of lithium may actually be mediated by mechanisms other than inhibition of GSK-3β . Genetic variations in GSK-3β have also been linked with the risk to depressive disorders, and most notably to bipolar disorder . Hence, GSK-3β is one of a number of key targets being explored with regards to possible new agents for circadian-related sleep-wake or mood disorders [62–64]. The adverse health effects of a disturbed circadian system are now under very active investigation. The major driver behind this increased focus on the 24-hour sleep-wake cycle and related circadian rhythms in clinical medicine has been the rapid progress in our understanding of the downstream effects on neurohormonal, metabolic, autonomic nervous and immune functions (see Figure 1). In humans, the aggregate outputs of the circadian system depend principally on the ways in which the brain, operating under genetic, behavioral (for example, eating behavior, physical activity), as well as other external (for example, light exposure, seasonality) and internal (for example, other sleep onset vs. awakening systems) cues, controls the central timing of circadian rhythms [47, 65–67]. The rhythmic expression of the core clock genes operates on a period slightly longer than 24-hours, unless it is modified or ‘entrained’ by key environmental inputs (in humans it is most notably the daily light–dark cycle). Importantly, the rhythmic and circadian output of the whole process has been remarkably preserved across species, indicating its fundamental importance to survival. As animals age it would appear that the combination of strong circadian rhythms and caloric restriction imparts additional advantages. The input of light signals from the eye to the SCN is critical to setting the circadian period to a 24-hour cycle. Changing light signals indicate not only the transitions from day to night to day but also the change in day length that occurs across seasons. Light signals are conveyed by a monosynaptic pathway (that is, the retino-hypothalamic tract) from the retinal ganglion cells (which contain the photopigment melanopsin) to the cells of the SCN (via a glutamatergic signal). Additionally, the SCN receives an important serotoninergic input from the median raphe nucleus (that is, via non-photic stimuli). Hence, those behaviors or disorders that are associated with changes in serotoninergic mechanisms (as well as compounds that alter serotonin concentrations) may also have important impacts on circadian-dependent phenomena. The serotoninergic, non-photic inputs and the glutamatergic, photic-dependent signals have opposite effects at the level of the SCN. With regards to external cues, it is clear that in humans the daily timing of a range of behaviors have an important influence on circadian rhythms . These include: (i) awakening and rising from bed; (ii) light exposure, particularly to light that is in the ‘blue’ spectra (which is most efficient in suppressing melatonin secretion) [68, 69]); (iii) physical activity and exercise, with additional effects of duration and intensity; (iv) eating patterns; (v) social and occupational activities; and, (vi) nighttime activity and related time of sleep onset. In humans, there is considerable inter-individual variability in the circadian phase, as well as variation in the peak periods of key behavioral (for example, mood, concentration, energy), neurohormonal (for example, cortisol peak, regulation of thyroid hormone) and body temperature elements. This intrinsic variability, which appears to be largely under genetic control, can be measured by self-report along a dimension of ‘morningness’ vs. ‘eveningness’ in the preferred timing for regular sleep schedules and other daily activities. Importantly, the tendency towards ‘eveningness’ has been associated with higher depressive symptoms [70, 71]. In twin studies of bipolar disorder, affected individuals (compared with their co-twin) show greater seasonal changes in sleep patterns and mood, consistent with the extent to which environmental influences on the circadian systems are, in part, mediated by differences in genetic sensitivity . The outputs of the SCN exert their influence on other key regulatory systems; first, in the brain (see the critical SCN-pineal/melatonin loop, Figure 1) and, second, on other major physiological systems (via their impacts on the pituitary and linked neurohormonal systems, thermoregulation, the autonomic nervous system and other signaling mechanisms). The key physiological result of these inter-linked processes is coordination of the internal environment so that the various hormonal, immune and metabolic factors are in synchrony with each other and, critically, with the behavior of the individual (for example, eating, sleeping, exercising). Lesion-based experiments have indicated that what is lost through destruction of the SCN is not the circadian system itself but this central coordinating role. Genetic alterations of clock genes in mice indicate the extent to which the coordination of key behavioral factors is disturbed. For example, mice with a point mutation in the CLOCK gene display: (i) hyperactivity over the light/dark cycle;, (ii) reduced depression-like behavior in rodent testing paradigms;, and, (iii) an increase in reward value in response to self-stimulation tests [73–75]. Alterations of clock genes also increase dopamine release, enhance sensitivity to dopamine receptor agonists, and alter the relative distribution of D1 and D2 receptors . Moreover, Per1-2 homolog dysfunctions in mice cause an increase in anxiety-like behavior and, conversely, a mouse model of depression leads to a reduction in Per1-2 expression . Accordingly, in humans, a growing body of evidence is linking various components of the molecular circadian clock to various health conditions, including mental disorders (for reviews, see [78, 79]). From a circadian perspective, one of the principal outputs of the SCN is communication with the pineal gland, which controls the daily pattern of melatonin release  (Figure 1). Again, this is a 24-hour feedback system, whereby light exposure (through the eye and signaled via the SCN) strongly inhibits melatonin release during daylight hours. This is followed by a rapid rise in melatonin secretion about two to three hours before habitual sleep onset (typically mid-evening). Melatonin has a wide range of CNS (including the SCN) and peripheral targets. Specifically, melatonin induces sleep onset, promotes optimal sleep architecture and coordinates other physiological and behavioral aspects of the sleep period. In turn, melatonin feeds back directly onto the SCN to inhibit the circadian signal for increasing wakefulness. It also competes with the activating effects of serotoninergic inputs to the SCN. In this way, endogenous melatonin (or the appropriate use of exogenous melatonin at the right point in the daily cycle) plays a key role in stabilization of daily rhythms. Some of these chronobiotic effects seem to be modulated by the interactions between melatonin and clock genes . The other key outputs of the SCN (acting initially via the paraventricular nucleus; PVN) include regulation of the pituitary release of key stimulating hormones and autonomic neurons (see Figure 1). These have their impacts on a wide range of peripheral organs. Most notably, from a circadian perspective, adrenocorticotropic hormone (ACTH) regulation of cortisol release from the adrenal glands is central to the coordination of brain-dependent mechanisms and peripheral physiology. In recent years, there has also been much greater focus on the extent to which other key metabolic functions in the liver and pancreas have their own intrinsic circadian patterns [82–86]. Importantly, food intake entrains the liver’s clock. Ideally, these metabolic patterns should be coordinated with signals from the SCN so that key aspects of feeding behavior, glucose control and fat regulation are optimally coordinated . Recent animal studies indicate that synthetic REV-ERB-a/b agonists alter the circadian timing of clock genes’ expression in the hypothalamus and locomotor activity, while enhancing energy expenditure and reducing fat, triglycerides and cholesterol levels . Importantly, circadian processes are one of two major regulatory systems influencing the daily sleep-wake cycle . The other is a homeostatic process directly related to wake duration; the longer the period awake, the greater the accumulated ‘pressure’ to sleep again (that is, sleep debt). While accumulated sleep pressure, in combination with nighttime melatonin release drives sleep onset, the circadian system is seen to drive the strength and rhythmicity of daytime wakefulness. The homeostatic sleep pressure component drives slow wave (or deep) sleep (SWS) while rapid eye movement (REM) sleep is strongly influenced by the circadian component (interestingly, it was once assumed that all effective antidepressants shared a capacity to suppress REM sleep). However, the optimal coordination of both of these mechanisms results in the maximal consolidation of sleep at night and wakefulness during the day. Another important aspect is the potential role of hypocretin/orexin, a key neuropeptide that also plays a central role in coordination of sleep-wake activity . The timing of normal hypocretin/orexin production is critical as it contributes to staying awake (in humans typically later in the day) as sleep debt increases. In both humans and animals, absolute orexin deficiency is linked to the narcolepsy-cataplexy syndrome [91, 92], while in animals a lack of orexin signaling increases risk of obesity . Novel orexin antagonists have been developed for the treatment of primary or chronic insomnia and are undergoing extensive clinical trialing [94–96]. Consequently, further manipulation of hypocretin/orexin signaling is now under consideration as another pathway by which sleep, circadian and disturbed metabolic functions may all be enhanced [87, 97]. In summary, we now have much more detailed knowledge of the ways in which the brain responds to a range of key environmental cues as well as the processes by which it, in turn, regulates the many other aspects of internal physiology that demonstrate specific rhythmic patterns (for example, hormonal, immunological and metabolic systems) [88, 98–105]. In the past, the traditional organ or clinical specialist-based approaches to clinical medicine have failed to take into account the health effects of important daily and seasonal fluctuations in key regulatory systems, such as the 24-hour sleep and circadian cycles. However, alongside the detailing of the molecular mechanisms of the clock and its signaling systems, the clinical applications of this new knowledge are beginning to be recognized. Twenty-four-hour sleep-wake and circadian cycles are now of great interest not only in sleep medicine and clinical psychiatry but also in aging and dementia, developmental and neurological disorders, obesity, diabetes and related metabolic disorders, immunology and infectious diseases, and cancer care. While in psychiatry generally, there has not yet been an effective translation of knowledge into clinical practice, this process has begun recently in the field of depressive disorders. Historically, various sub-classifications for major depression have been proposed. Typically, each has prioritized different phenotypic characteristics (for example, severity, psychotic features, psychomotor change, presence of manic or hypomanic episodes, somatic or ‘atypical’ features) . Although the more severe forms (for example, depression, bipolar disorder, melancholia, atypical and psychotic depression) implied a preferential response to biomedical therapies, only the psychotic forms demonstrate robust differences between active physical and placebo treatments . To date, none of the phenotypically-derived sub-types have been clearly linked to a discrete pathophysiology. Further, no clear pattern of specific illness markers has been identified to aid diagnostic specificity or act as a useful proxy for personalized treatment selection or responsiveness. While the 1990s saw the start of two decades of intensive genomic and brain imaging studies, the 1980s had seen the groundwork laid for three decades of population-based epidemiology and the much broader recruitment of subjects with less severe, persistent or recurrent disorders to clinical trials. Using standardized criteria, these studies identified large numbers of people in the broader community who met criteria for major depressive episodes . In these broader populations, the large differences between active and placebo treatments evaporated and the differences between various physical and psychological approaches were minimized (see [1, 2]). The unintended consequences of these movements have been profound. On the one hand, it has led to a sustained critique by mental health specialists who discount the application of the clinical diagnosis of major depression in the wider population and, hence, call for a return to the earlier diagnostic systems that were derived from more severely or persistently-ill populations. Conversely, those more accustomed to primary care or population-based health perspectives sought to work with the new epidemiology, and, particularly, those key longitudinal studies from childhood or adolescence through to adulthood. These have also been enhanced by genetically-informative family and twin studies [107–109] as well as relevant risk factor studies . This developmental perspective has generated new hypotheses about lifetime pathways (and underlying pathophysiologies) to adult depressive disorders [110, 111]. The one key differentiation supported by genetic and environmental risk factor research, longitudinal and treatment studies and extensive concurrent neuroimaging and neuropsychological studies is the demarcation between early (that is, less than 25 years of age) and late-onset (typically after 50 or 60 years of age) depressive disorders [18, 111, 112]. Late-onset depression has its own clear set of vascular and other neurodegenerative risk factors [18, 113–116] and represents one of the few psychiatric disorders where there is now a clear pathophysiological model (that is now being used to underpin population-based prevention and early intervention as well as clinical practice) [19, 117–120]. It is for those with early-onset depression, however, that new insights are desperately required. A new wave of clinical studies is focused on younger people and within those cohorts at least three clear trajectories of illness are increasingly apparent (see Figure 2). The most common would appear to be that dominated by child and adolescent anxiety, with the onset of more discrete depressive symptoms in early and mid-adolescence. It is this common form which offers perhaps the greatest hope for broadly-applied prevention and early interventions utilizing well-founded cognitive and behavioral strategies . The second, and largely ignored by the traditional mood disorders literature, is that related to other childhood onset and adolescent-related conduct, behavioral and attention disorders. The third appears to be a pattern of mood disorders which may well be characterized better as disorders of energy or activity due to underlying perturbations of sleep-wake cycles and linked circadian rhythms. This last type is the subject of the remainder of this paper. Pathophysiological pathways to early-onset depressive disorders. There are at least three common trajectories that lead to depression in the teenage and early-adult years. These are characterized by (1) ‘anxiety-central nervous system reactivity’, (2) ‘circadian and 24-hour sleep-wake cycle dysfunction’, and (3) ‘developmental brain abnormalities’. The six corresponding phenotypic patterns have distinct ages of onset and characteristics. From age 8 to 10 years onwards these processes are transformed by key neurobiological phenomena: (a) puberty, (b) adolescent brain development, and (c) sleep-wake cycle [see . As the debate about the pathophysiology of mood disorders has focused primarily on the assumption that the core pathology(ies) must relate to disordered emotion, other features such as sleep-wake cycle and circadian changes have been downplayed. Most typically, major depressive disorders (see Table 1) have been associated with a wide range of perturbations of sleep and circadian physiology. Up to 60% of young persons with depressive disorders run an illness course characterized by marked delays in the sleep-wake schedule , and these fluctuations are often accompanied by changes in subjective energy, cognitive functions and mood. Very recent epidemiological evidence emphasizes that this pattern is clear from the onset in early to mid-adolescence and, contrary to previous dogma, does not develop solely in the early or mid-adult period . Other evidence suggests the extent to which this pattern of low energy, as distinct from depressed mood, has its own set of genetic and environmental determinants in adolescence , as well as in mid- or later-life [125–130]. Key features, such as onset of illness episodes, in relation to changes in sleep patterns and/or season have not necessarily been emphasized. For some patient subgroups these involve characteristic shifts into or out of periods of prolonged depression, oversleeping, low energy and apathy. For others (notably those on the bipolar spectrum), this may also result in discrete periods of decreased sleep, high energy, increased activity and irritability or excitement. Other indicators of disturbed circadian rhythm are observable in patients with major depression including changes in the normal patterns of diurnal mood variation or loss of normal daily variations in body temperature (with elevated mean nocturnal temperatures resulting in the perception of nighttime ‘sweats’). The possible role of the circadian clock in the pathophysiology of depression is also supported by post-mortem histological anomalies in the SCN of depressed individuals . A large number of sleep or circadian abnormalities have been documented across the various forms of major mood disorders (see Table 1). In some forms of depression, notably those ‘typical’ or ‘melancholic’ forms associated with early morning wakening and marked diurnal mood variation (often occurring in older rather than younger subjects), there may also be a marked change in the normal circadian variation in motor activity, with a shift towards shorter and more disturbed sleep and a phase advanced pattern. That is, the end result is being awake and potentially more agitated in the early hours of the morning. Overall, however, such forms of depression are associated with psychomotor slowing and a reduction in total daytime activity [222–226]. These severe forms of depression are also typically associated with decreased appetite and weight loss. By contrast, ‘atypical’ forms of depression, which are often seen in teenage and young adult patients, are associated with later sleep onset, later sleep offset, prolonged rather than shortened sleep, daytime tiredness and fatigue as well as loss of motor activity in the mornings. These disorders are often associated with overeating, weight gain and increased risk of metabolic dysfunction. These patterns suggest underlying phase delay in the circadian system. The symptoms of circadian disturbance seen in subgroups of depressive disorders are also accompanied by observable changes in the normal circadian patterns of release of ACTH (regulating cortisol release) and thyroid-stimulating hormone (TSH; regulating thyroid hormone release). The typical morning peak of cortisol release is normally well matched to the associated feelings of energy and our capacity to cope with physical stressors. The resulting altered patterns of cortisol release are generally consistent with underlying phase advance or loss of synchrony with other elements of the daily cycle. Changes in such key patterns of cortisol release appear to correlate also with daytime feelings of lack of energy and fatigue. Similarly, while there is evidence of changes in the amplitude and timing of the TSH release pattern, it would also generally suggest a pattern of phase advance. Of additional importance to the increased interest in sleep-wake cycles and circadian rhythms and risk of mood disorders, has been the recognition of the commonality between genetic determinants of circadian functions and those genes which may increase risk of mood disorders, particularly bipolar disorder . While further studies are required, so far, variations of Per3 have been associated with age of onset of mood disorders, response to treatment and circadian mood variations  and Per 3, Bmal1, CLOCK, Nr1d1 and Nr1f2 have all been linked to bipolar disorder [229–234]. Another related set of studies has begun to investigate whether the same genetic factors that predict response to antidepressant medicines also predict response to specific circadian-based therapies, such as light therapy or sleep deprivation . In those with major depressive disorders, disturbances in the amplitude and rhythm of melatonin secretion have been described [see Table 1]. These are similar to those described in a range of other sleep or neuropsychiatric disorders associated with disturbed circadian function. Although phase advance and phase delay in melatonin secretion have both been reported, phase advance (largely in middle age and older cohorts) may be more typical. Additionally, changes in the rate of rise of evening melatonin and the amplitude of the melatonin response have been associated with various mood disorders. The findings with regards to phase advance versus phase delay for melatonin, cortisol and other circadian parameters in patients with major depression may be strongly influenced by the age of the subjects. Various relationships have been reported between the severity of these changes in timing or amplitude and reported severity of depression or degree of sleep disturbance. For those with bipolar disorder, there have been distinctly different patterns of melatonin secretion reported during the manic (phase advanced) as compared with the depressive phase (phase delayed). For those with major depressive disorders, the role of sleep-wake cycles or circadian perturbations may be quite different at various life stages. For the early-onset group, it is likely that sleep-wake and circadian disturbances represent one discrete pathway to disorder; while for those with the late-onset sub-type, sleep-wake disturbance may be linked with concomitant structural and functional brain changes due to underlying vascular or neurodegenerative processes (see review by [19, 236–238]). One of the areas of greatest therapeutic frustration has been the treatment of the depressive phase of bipolar disorder. Importantly, conventional monoamine-based medications are of least benefit in these patients. At this time a new range of second generation antipsychotic medications, anticonvulsants and other mood-stabilizing agents form the basis of care (often in combination with antidepressant agents). Conventional lithium therapy is not an effective monotherapy for bipolar depression. Given the very strong circadian features of bipolar disorder, and this failure to develop effective therapies for the depressive phase based on monoamine targets, it (along with the other circadian-like mood disorders such as seasonal affective disorder, winter depression, seasonally-sensitive unipolar depression, bipolar spectrum disorders, atypical depression) may benefit from a new circadian-based approach to treatment selection. A recent report suggests that adjunctive use of a novel melatonin agonist (ramelteon) may help to prevent relapse of bipolar disorder, and most notably relapse into the depressive phase . Various authors (see [34, 35] for review) have proposed that what may be most characteristic of the neuropsychiatric disorders is the extent to which they result in ‘desynchrony’, that is, both loss of synchrony between the key behavioral and physiological events as well (see Figure 3) as loss of synchrony between the various physiological events (that is, in the CNS itself and the key peripheral systems). Many human studies of dysregulation of central hormones (for example, HPA axis), or immune function, in those with major depression and a range of other neuropsychiatric disorders have moved their emphasis away from recording absolute changes in serum levels to evaluating putative changes in relation to deviations from normal circadian patterns [146, 151, 165, 167, 168, 240]. The normal synchronous relationships between sleep and daytime activity and cortisol, melatonin and body temperature. Major depression appears to be characterized by loss of synchrony between the different sleep-wake, mood, cognitive, motor, hormonal, immune, thermoregulatory and/or metabolic aspects of the normal circadian rhythm . In addition to its detrimental effects on the sleep-wake cycle, this internal desynchrony may well account for the range of somatic symptoms (fatigue, temperature dysregulation, muscle pain) and other physiological abnormalities that have been linked to various forms of major depression. While it has previously been assumed that circadian signaling mechanisms from the brain to the periphery (see Figure 1) are maintained largely by hormonal signals, recent evidence suggests a key role of daily variations in body temperature . It is tempting to postulate that the blunted amplitude of the temperature rhythm commonly found in patients with major depression could be a major driver of internal desynchronization, and, hence, of many of the somatic symptoms of depression as well as some of its metabolic and immunological complications. If this were so, restoration of the normal variation in body temperature across the 24-hour cycle would be a key therapeutic target. This may be manipulated by strategies designed to increase body temperature in daylight hours (particularly early morning – for example, with vigorous exercise) or decrease body temperature in the evening (that is, through environmental or pharmacological manipulations). A key aspect of those studies that focus on disruptions of sleep-wake cycles and circadian rhythms is the capacity to integrate a number of new detailed objective measures (Table 2). These complement extended self-report measures of daily fluctuations in sleep, mood, energy or physical activity. They include extended periods of actigraphy (for example, typically at least two weeks), as well as 24- to 72-hour assays of body temperature and 24-hour fluctuations in cortisol or melatonin (including under controlled environmental parameters, such as light exposure). Even though actigraphy measures are indirect and somewhat more variable (at least in the short term) than other circadian markers, because of other behavioral and homeostatic influences, they have consistently been found to correlate with the circadian rhythm of endogenous melatonin and body temperature [242–249]. Other new technologies, such as smart phone applications, permit home monitoring of extended periods of sleep-wake cycle behavior and patterns of physical activity. - Identification of insomnia, dysfunctional sleep and circadian-rhythms. - Characterization of the sleep-wake cycle. - Assessment of treatment response. - Differential diagnosis of various sleep disorders. - Characterization of sleep macro/microarchitecture. - Identification of insomnia, dysfunctional sleep and circadian rhythms. Within the research environment, the introduction of direct ecological monitoring systems [250, 251] continues to provide important new insights into the daily patterns of physical activity, daytime resting, eating and other key social behaviors, alongside data related to subjective energy or mood levels. These types of studies have the capacity to reveal important longitudinal associations between daytime activity, sleep-wake cycle timing and mood and other psychological and neuropsychological variables. When the various sleep-wake technologies are applied in younger subjects in the early phases of major mood disorders, a quite different pattern of sleep and circadian rhythms emerges in comparison to young persons without mood disorders or middle-aged subjects with mood disorders. Our own studies highlight two key aspects in young persons with mood disorders, namely: (a) the predominance of delayed sleep phase (that is, not only going to bed later, but also rising later)  rather than the more characteristic pattern of phase advance that has traditionally been linked with more severe forms of depression in mid and later-life; and, (b) a late dim light melatonin onset (DLMO) compared to values classically found in young healthy persons [42, 212]. This delayed pattern of the sleep-wake cycle and endogenous circadian rhythms is most marked in those with bipolar than unipolar phenotypes [123, 212]. Importantly, longitudinal prospective studies are needed to identify sleep-wake or circadian predictors of mood disorders early in the course of illness. Notably, promising findings in youth have highlighted the predictive value of sleep problems and specific polysomnographic (PSG) markers for the future development of mood disorders [252–255] and the transition from unipolar to bipolar depression . Such technologies can also be applied in older subjects with late-life depressive or early neurodegenerative disorders. Here, our data shows that greater nocturnal wakefulness as measured by actigraphic monitoring relates to neuropsychological dysfunction in late-life depression , mild cognitive impairment , and REM sleep behavior disorder in Parkinson’s disease . However, in these cohorts, even cross-sectional self-report measures of sleep quality appear to be useful correlates of phenotypic features, including depression  and neuropsychological impairment . Several PSG studies of persons with major depressive disorders have been conducted. Yet, PSG is costly and time consuming, often requires an adaptation night and requires time intensive scoring by sleep technicians. By contrast, self-report questionnaires, actigraphic recordings and sleep-wake cycle diaries are more accessible screening and measurement tools (Table 2). However, there is a clear need to link this new emphasis on extended actigraphic measurements of both sleep-wake cycle and circadian profiles with both PSG and more detailed measures of the full range of other indicators of circadian timing and synchrony (that is, body temperature, cortisol, melatonin and immune measures). While there is a long tradition of studies examining the effects of sleep-wake or circadian interventions in persons with major mood disorders (see Table 3), they do not figure prominently in major therapeutic guidelines for these common conditions [261, 262]. By comparison with the size of large pharmaceutical trials focusing on modification of monoamine systems, and similarly psychological therapy trials focusing on cognitive, interpersonal and related behavioral factors, the evidence-base for sleep-wake and circadian interventions is only modest. Consequently, in major depression guidelines sleep and circadian-relevant interventions are referred to only as a general management strategy (for example, enhancing ‘sleep hygiene’ or promoting physical activity) or sleep and circadian related phenomena are viewed as possible presentations of alternative primary medical diagnosis (for example, sleep apnea). As most treatment guidelines (based on DSM-IV or International Classification of Diseases (ICD)-10) utilize a simple severity model (that is, mild/moderate/severe), for the clinical management of major depression it is not surprising that an approach focusing on a putative sleep-wake cycle or circadian pathophysiology is not central to treatment selection for people with major depressive disorders. Another difficulty is that relevant information is distributed across a broader literature notably in relation to bipolar disorder, primary insomnia, other primary sleep disorders, chronic fatigue, geriatric medicine and other areas of general medicine. One of the more attractive features of the various sleep and circadian-based antidepressant approaches (behavioral or pharmacological) available appears to be the relatively rapid onset of action. Given the much slower onset of action of conventional psychological or monoamine-based treatments, it is very surprising that this relative benefit is underemphasized in clinical practice [263, 264]. Despite these conceptual and organizational biases, it is possible to construct an extensive list of potentially therapeutic sleep-wake cycle and circadian interventions available for use in persons with major mood disorders (Table 3). Rather than providing separate information about nighttime/sleep vs. daytime/wake activity, this approach focuses on collating these perspectives within one framework focused on optimizing the 24-hour sleep-wake cycle. Additionally, it provides a more in-depth explanation of key aspects of circadian biology (for example, the importance of rising time and exposure to morning sunlight to suppress melatonin - see Figures 1 and 4). The tying of these factors with broader notions of social rhythms is also encouraged . For those requiring more specific modifications of sleep-related phenomena, a range of key behavioral strategies is relevant [143, 266–272]. Within this context, the use of specific forms of light therapy or daytime light exposure has received considerable attention [271, 273–278]. Psychoeducation and monitoring worksheet for patients with mood disorders and sleep-wake and circadian disturbance. A wide range of pharmacotherapies has been utilized to manage sleep disturbance and related mood and cognitive phenomena [for a review, see . Until recently, these have relied heavily on non-specific sedative strategies at night or stimulant-based approaches during daylight hours. These approaches, particularly when they are combined with appropriate other behavioral interventions, are likely to produce some short-term benefits. The place of traditional monoamine-based antidepressant strategies in the management of sleep and circadian related disorders remains controversial. While serotoninergic inputs to the SCN are consistent with the concept that these agents have the capacity to affect circadian patterns directly, the effects of these therapies on circadian parameters have not been studied extensively. More often, the effects of monoamine-based therapies on key sleep parameters (sleep latency, REM latency, sleep architecture and suppression of REM sleep) have received attention [280–282]. The older tricyclic agents (TCAs) are still widely prescribed for their sedative properties and the extent to which more recent SSRI and selective norepinephrine reuptake inhibitor (SNRI) agents disturb sleep during the early phases of therapy (resulting in co-prescribing of hypnosedatives, TCAs or low dose antipsychotics) has been widely reported. Given the essentially activating inputs of serotonin to the SCN (see Figure 1), this effect is not surprising. It certainly raises questions about the optimal timing of administration of these compounds, which for convenience (or to minimize other side-effects) are often taken at night. The new question is whether any of the more recent melatonin-based products (particularly when taken at night) offer any specific benefits, from a sleep architecture, sleep-wake cycle, circadian or mood disorders perspective, compared with the conventional non-specific approaches. While melatonin has not traditionally been considered to be a viable antidepressant alone [283–285], the registration of agomelatine in the European Union and internationally (but not in the USA) as a treatment for major depression has again raised questions as to whether melatonin itself has significant antidepressant properties. What is more likely is that there are specific subgroups of those with major depressive disorders (and most obviously those with depression with chronic insomnia, circadian dysfunction, seasonal features or bipolar depression) who are likely to derive antidepressant benefits from melatonin, agomelatine or other melatonin-based analogues. Although agomelatine has been evaluated for short and longer-term efficacy by the European Medicines Agency, it has not been presented to the FDA for registration in the USA. Further, there has been considerable academic debate as to the relative efficacy of agomelatine compared with placebo or other available antidepressant agents [315–317]. Importantly, the differential effects of agomelatine as compared with SSRIs on sleep architecture has only recently been subject to investigation, with an initial study favoring the short-term benefits of agomelatine on key sleep parameters . There is an ongoing need for further comparative studies. A very recent report suggests that another melatonin analogue, ramelteon, when taken adjunctively with other therapies may have benefits in preventing relapse into depression in patients with bipolar disorder . What is most apparent is that therapies that result in phase advance in circadian rhythms are largely antidepressant in effect. The best studied examples are morning bright light therapies, partial sleep deprivation and enforced early morning rising [319–322]. Information from relevant pharmaceutical studies indicate that SSRI drugs induce a phase advance in the firing of SCN neurons in culture and that agomelatine induces a phase advance in endogenous circadian rhythms [322, 323]. These phase-advancing effects of monoamine and melatonin-acting agents are contrasted with those of lithium, which can induce a phase delay [290, 324–326]. However, in clinical studies lithium has its principal effect on mania (and prevention of manic relapse) rather than acute depressive states. Other novel pharmacological agents are under investigation for their capacity to induce a phase advance or restore normal circadian patterns (acting via effects on other regulatory proteins, such as CK1-delta). However, it is not yet known whether such agents have antidepressant or other mood stabilizing properties (See ). The development of novel therapeutic strategies for circadian-based mood disorders (and other closely-related neuropsychiatric syndromes) is now likely to focus on behavioral or pharmacological strategies that: (i) phase advance circadian timing, as this is the strongest correlate of an antidepressant response. This may be achieved by focusing on SCN molecular targets to alter period length or by making greater use of behavioral or pharmacological approaches that entrain or enhance melatonin secretion; (ii) entrain rhythms more robustly in those clinical situations in which there is strong evidence of only weak linkage to the day-night cycle or evidence of chaotic or frequently-changing patterns. In clinical psychiatry, the depressive and mixed mood phases of bipolar disorder are likely to be the main targets. These may include strategies akin to lithium and may be associated with phase delay or phase advance in timing. Current melatonin-based strategies may also be central to this approach; and (iii) restore normal internal synchrony of key behavioral, neurohormonal, metabolic, autonomic and immunological systems. This may be achieved by a variety of existing mechanisms (for example, behavioral and pharmacological approaches to enhance melatonin release) or novel mechanisms that target the molecular mechanisms of the SCN, melatonin release by the pineal gland or factors that modulate other key hypocretin/orexin or leptin-associated mechanisms. In those subjects with mood disorders who have been identified as presenting key features consistent with underlying perturbations of sleep-wake cycle or circadian systems, it is possible to set out a therapeutic program over a six- to eight-week period (Table 4). The key features are strong reliance on self-monitoring, highly structured planning of waking, activity, sunlight (or adjunctive light) exposure and sleep schedules. Strong educational elements about the underlying neurobiology and frequent reviews of difficulties encountered, as well as careful monitoring of the mood disorder and associated risks are essential (see Figure 4). In this process, decisions about adjunctive specific pharmacotherapy for either the circadian or depression elements are delayed until at least four weeks, although the use of melatonin may be considered after two weeks. A key consideration in such programs is the age of the patients and the direction and degree of phase shift. In younger subjects, there is a normal developmental change in sleep and circadian rhythms with a shift towards phase delay throughout the late adolescent period. Hence, phase advancing strategies in this group need to be cognizant of a return to normal developmental patterns. For older subjects, the converse may be in operation with a marked shift towards earlier sleep onset and sleep offset times. In relation to both sets of arrangements, it is as important to focus on the degree and timing of daytime activity and other related behaviors (for example, controlling excessive daytime napping) as it is to focus on nighttime behavior. 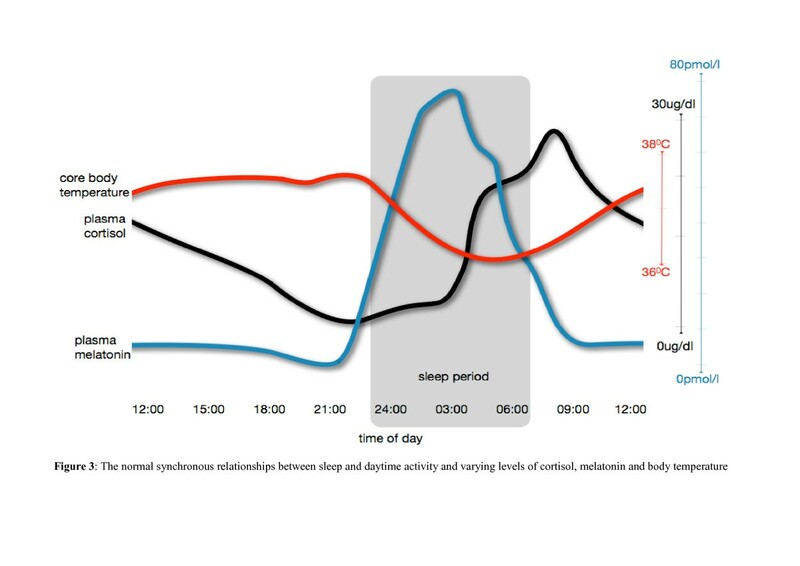 At this time, the style of prolonged actigraphy-based sleep-wake cycle measurements - that are essential for personalizing treatment regimens - are not in common clinical use. Hence, there is a need to introduce them more widely and for their use to be augmented by appropriate prolonged reports of mood, behavior and sleep quality (that is, ‘mood, sleep and behavior diaries’ – see Figure 4). Importantly, such measures are only indirect indicators of underlying circadian biology. That is, they cannot be used to confirm the presence of internal desynchrony, as this requires simultaneous monitoring over at least a 24-hour period of various endogenous measures, such as melatonin, cortisol or core body temperature. However, as body temperature recordings and other physiological measures become more widely available, these may also become more consistently used, especially if empirical studies continue to refine our understanding of the evolution of these markers across the various stages of affective illnesses. From a therapeutic perspective, the direct or indirect effects of many available psychotropic compounds on circadian biology have not yet been clarified. Although the availability of melatonin and melatonin-based agonists has already had an impact in the insomnia field, its direct relevance to those with primary mood (including both unipolar and bipolar) disorders is still unclear. With the emergence of hypocretin/orexin antagonists, it is likely that further complexities will become apparent. The imposition of rigid behavioral or timing schedules on different groups of patients is clinically challenging. In general terms, this is particularly so for younger subjects who experience a normal adolescent period of phase delay (and may also need to fit with school or other educational schedules) and older subjects who may be experiencing significant phase advance. Additionally, those with different underlying chronotypes (‘morningness’ vs. ‘eveningness’) will vary in their capacity to incorporate major changes in daytime scheduling into their lifestyle. There is an urgent need in clinical psychiatry to advance more personalized approaches to syndrome description and treatment selection. In our view, this goal is now within reach, at least for that subpopulation of people with mood disorders who have clear evidence of disturbed circadian physiology. Current estimates among adult populations (based on the bipolar spectrum concept) indicate that this may be in the order of 40% of middle-aged patients . This departure from traditional antidepressant strategies has been possible due to four factors: (i) major advances in the basic neurosciences of sleep and the related circadian systems, with great detailing of the molecular machinery of the circadian clock and the processes by which it both responds to external cues and regulates internal physiology; (ii) developmental studies of sleep-wake cycle and circadian parameters of people (teenagers, young adults and older persons) close to the onset of their major depression; (iii) use of more objective and specific measurement assays and longer-term monitoring systems for circadian dysfunction in humans; and, (iv) development of new and more specific behavioral (incorporating education, sleep rescheduling, light exposure and daytime physical activity) and pharmacological (largely melatonin-based) therapies for treatment of mood disorders. A much greater focus on circadian-based major depressive disorders has the potential to deliver clinical psychiatry what it has always desired – a diagnostic grouping linked with strong objective measures of illness state and a basis for more rational treatment selection and monitoring of response to targeted behavioral or pharmacological interventions. IBH and DFH are supported by an NHMRC Australia Fellowship awarded to IBH (464914). SLN is funded by an NHMRC Clinical Research Fellowship (402864). RR is funded by a scholarship from the Fonds de recherche du Québec - Santé. This work was further supported by NHMRC Program Grant (566529). IBH has led a range of community-based and pharmaceutical industry-supported depression awareness and education and training programs. He has led depression and other mental health research projects that have been supported by a variety of pharmaceutical partners. Current investigator-initiated studies are supported by Servier and Pfizer. He has received honoraria for his contributions to professional educational seminars related to depression, youth mental health and circadian rhythms research. EMS has received honoraria for educational seminars related to the clinical management of depressive disorders supported by Servier and Eli-Lilly pharmaceuticals. She has participated in a national advisory board for the antidepressant compound Pristiq, manufactured by Pfizer. DFH has received honoraria for educational seminars from Janssen-Cilag. DSM-5: the future of psychiatric diagnosis. http://www.dsm5.org/Pages/Default.aspx. Psychiatry’s bible, the DSM, is doing more harm than good. http://articles.washingtonpost.com/2012-04-27/opinions/35450916_1_bipolar-disorder-psychiatric-ward-psychiatric-drugs.